Huawei has taken the wraps off its latest flagship smartphones: the P30 series. The Shenzhen-based company unveiled the all-new handsets in Paris today – the same city where its predecessors, the P20 and P20 Pro, were announced last year. The Huawei P30 boasts better battery life, redesigned display, improved waterproofing, and an upgraded camera system. According to Huawei, the latter has "rewritten the rules of photography," although we'll be putting that incredibly lofty claim to the test in our review in the coming weeks. From the outside, its immediately clear that this is an iterative update on the Huawei P20 rather than a complete reinvention – like the move from the Huawei P10 to P20. Huawei has kept the gorgeous "gradient" finish on the rear case, which shifts between different colours depending on the light. And why wouldn't it? It looks stunning and really stands out from the sea of indistinguishable aluminium Android devices. According to Huawei, the P20 series helped it become the only manufacturer in the UK to sell more handsets with a colour case, instead of the plain black finish, which is typically the biggest seller. The Huawei P30 ships in five different colours: Breathing Crystal, Amber Sunrise, Pearl White, Black, and Aurora – which seems to just be a new name for the Twilight finish we saw on the P20 and P20 Pro. Elsewhere, the Huawei P20 is very similar to the P20 Pro from last year. It has inherited the triple-camera design, rather than being lumbered with just two lens, so can now use the 3x lossless optical zoom feature first introduced with the P20 Pro. That triple-camera is comprised of a 40-megapixel f/1.8 wide-angle "SuperSpectrum" sensor, coupled with a 16-megapixel ultra-wide angle, and an 8-megapixel telephoto lens. If you're unfamiliar with the term "SuperSpectrum", it's marketing bumf for the new camera technology Huawei has developed for the P30 series. Rather than using the standard RGB (Red-Green-Blue) sensor – like literally every other smartphone camera on the market, Huawei has decided to use a RYYB (Red-Yellow-Yellow-Blue) one. That's because Yellow sensors can absorb twice as much light, collecting more information than the standard Green sensor ever could. As you'd expect, ditching the typical RGB configuration requires a pretty fundamental rethink on how to process the information gathered by the camera. Huawei says they've been working on this technology for years, but it's only just managed to bring the solution to market. It wasn't simply a case of swapping out the sensors for an RYYB variant, either. Huawei had to completely rework how its flagship Kirin 980 Image Signal Processor handles input from the camera to make sense of the date. The company clearly believes all this work will result in much more detailed images, with better low-light performance. Elsewhere, Huawei is now using a combination of Optical Image Stabilisation (OIS) and AI-powered digital stabilisation to remove any trace of a wobble from your stills and videos. It will also help to remove any blur from shots taken with the dedicated Night Mode, which keeps the shutter open for longer to draw-out every bit of available light. On the front of the P30, Huawei has slimmed down the small notch at the top of the display – very much like what OnePlus did when it moved from the OnePlus 6 to the OnePlus 6T last year. This has enabled Huawei to increase the size of the screen to a 6.1-inch FHD+ resolution OLED. That's quite a step-up from P20's 5.8-inch display. Despite the smaller size of the notch, Huawei has still managed to pack an impressive front-facing camera. The P30 has a 24-megapixel sensor that supports the company's improved Super HDR technology, which should preserve details in the shadows and highlights better than its predecessor. When it comes to logging into the phone and authenticating secure apps and transactions, Huawei has opted for an in-display fingerprint scanner. Unfortunately, this isn't the fancy ultrasonic variety you'll find on the Galaxy S10 that works in the rain, this is an optical variant, like the ones used in the OnePlus 6T and Mate 20 Pro. According to Huawei, it's more accurate and speedier than the latter. Thankfully there's a hefty 3,650mAh battery cell underneath the bonnet. That's a step-up from the 3,400mAh cell included in its predecessor. According to Huawei, the latest advances in its onboard AI and battery management brought about by the latest Android software mean the P30 will manage even better battery life than P20 Pro, which had a bulkier 4,000mAh cell. If those claims are accurate, this new handset should have some serious stamina. The P30 also boasts better water and dust resistance than its predecessor, although that's damning with faint praise. 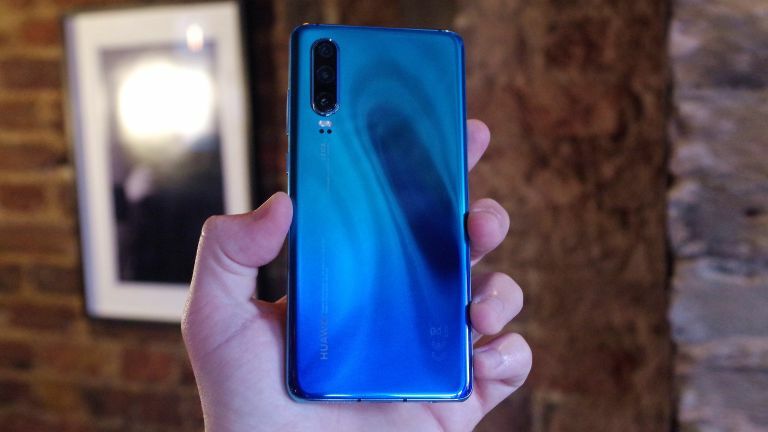 Huawei claims the P30 has an IP53 rating, which means it will not be negatively affected by any dust that infiltrates the case, but can't survive much more than a light spray of water, like a dash through the rain. Huawei has announced plans to work with Audi to enable your P30 smartphone to unlock your vehicle remotely and start the engine. The feature isn't quite ready at the moment, Huawei says, although it hopes to support around seven different models in the near future. Huawei P30 will cost £799 in the UK. It ships with 6GB of RAM and 128GB of built-in storage. Pre-orders start today, March 26, 2019.